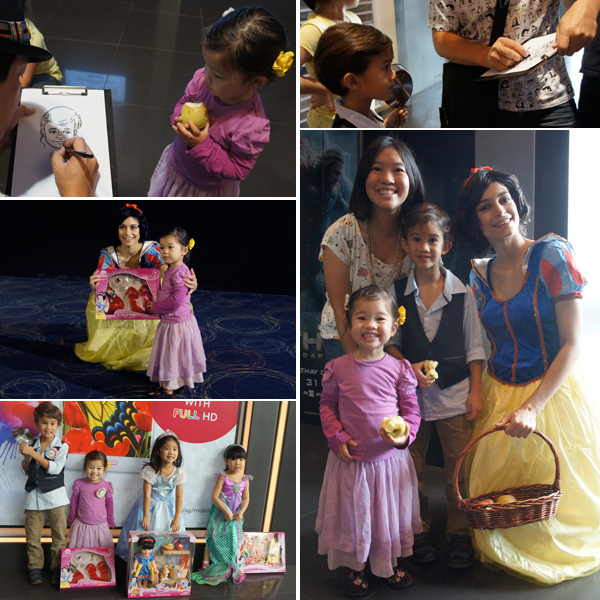 Last weekend, my family and I were very privileged to be invited to a preview of Disney’s Princess Film Festival at Cathay Cineleisure Orchard. 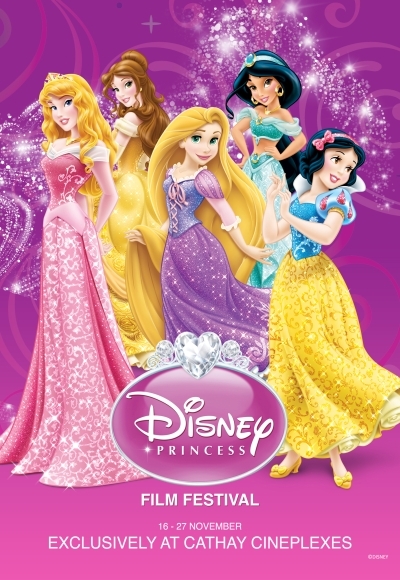 Disney’s Princess Film Festival will be taking place from 16 – 27 November 2013 at Cathay Cineplex Cineleisure Orchard and AMK Hub. The film festival will showcase five classic Disney Princess movies and culminating in the release of Disney’s latest animated feature, FROZEN, on the 28th November 2013. 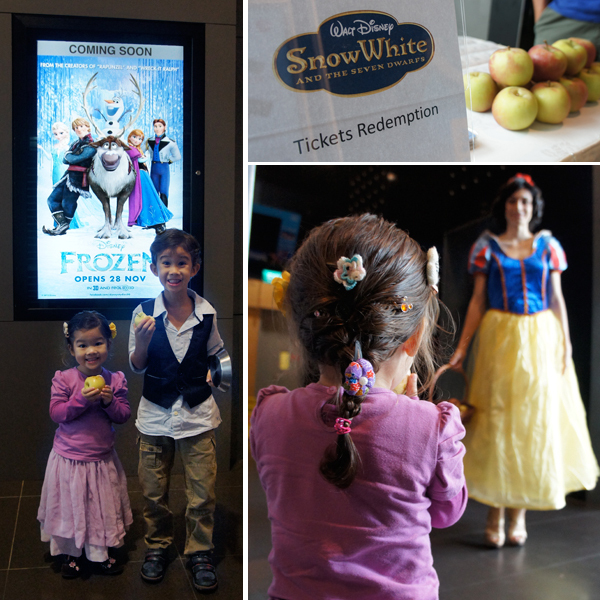 As part of the Film Festival, we attended a screening of Disney’s first full-length animated movie, Snow White and the Seven Dwarfs. Little E and J were very excited as they had not watched this movie before, so it was a real treat for them! There was also a fancy dress competition at the preview, so both the children were very busy the day before putting together their costumes. Can you guess who J and Little E were dressed as? Yes! 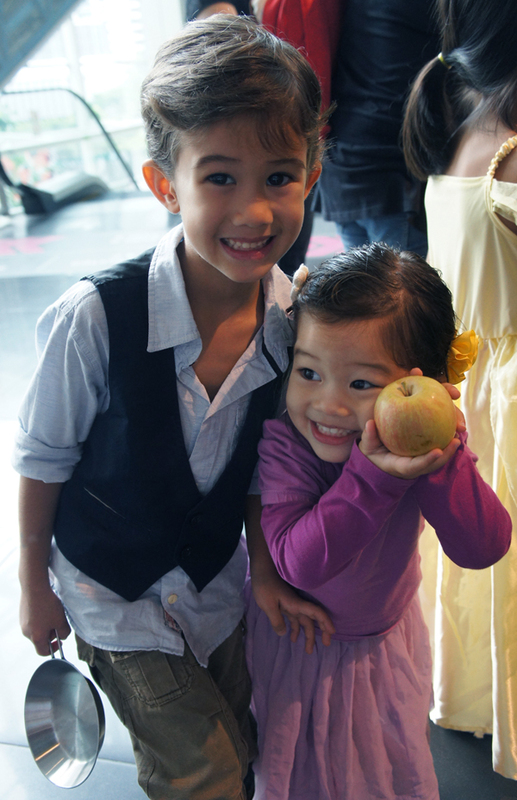 They were dressed as Rapunzel and Flynn Rider from the movie, Tangled (which will also be shown during the Film Festival)! 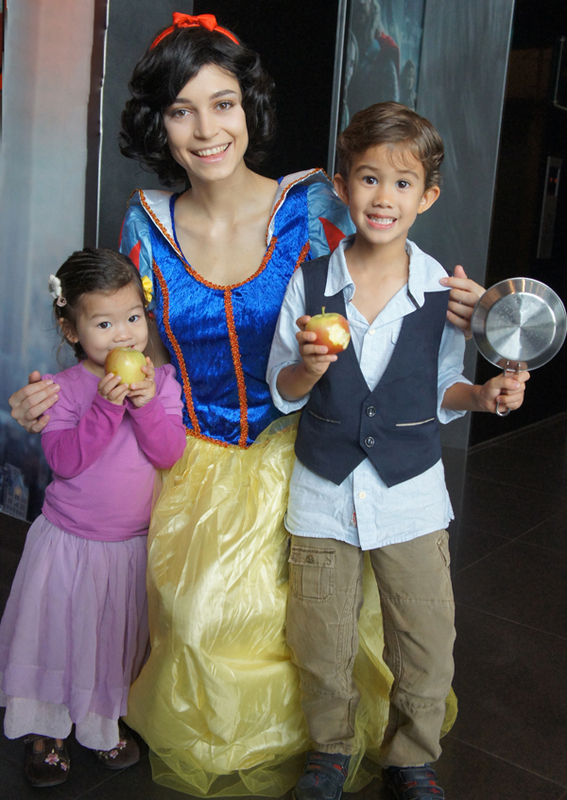 If you are wondering why both J and Little E are clutching fresh apples in all the pictures, it is because they were each given an apple as a token of welcome from the lovely Snow White, who was waiting to greet all the children. Both J and Little E were kept happily busy – munching on their apples – so when the good folks from Caricuturist came by, they were both standing quite still and made for great models. Adam, the caricature artist, was able to capture both J and Little E on paper within minutes, deftly sketching their smiling faces and adding details from their costumes. Watching him work was like magic! I think I shall be framing those pictures for their bedroom wall. It was such fun to see so many little children decked out in all their finery. Some of the little girls even wore official Disney Princess costumes! In the picture above, you can see Sophie from A Juggling Mom dressed as Ariel from The Little Mermaid, and Anya from Life in the Wee Hours as Cinderella. All the girls we saw at the Film Festival looked so pretty in their spangly dresses, so we were all absolutely bowled over when Little E won a small prize for her Rapunzel outfit! Yay, Little E! Little E was absolutely thrilled to be called up to receive her prize -a Snow White Dress Up Kit – from Snow White herself. She couldn’t stop looking at it! I had to pry the box from her little hands once the movie started. Both J and Little E LOVED watching Snow White and the Seven Dwarfs. Little E was so moved by Snow White’s treble singing voice, that she started to cry. Watching this classic film on the big screen brought back so many childhood memories for me! There’s so much detail in the film that I missed as a child, and it was amazing to watch it again with my own little girl sitting next to me. I gotta say that it is looking pretty good! J and Little E were intrigued by the palace of ice and snow, and they laughed when Olaf the snowman appeared. Now that I’ve seen the trailer, I am really looking forward to the release of the new Disney film on 28th November 2013! Tickets to Disney’s Princess Film Festival are now on sale at Cathay Cineplexes and you can also buy them online here. Tickets are priced at $9 ($8 for Maybank Cardmembers) and every pair of tickets entitles you to a limited edition FROZEN sticker sheet. What’s more, if you buy 6 tickets in a single transaction, you get to bring home a special Sparkling Princess Doll from Mattel. Cool, right? I’m thinking of taking the kids to see Sleeping Beauty, or maybe Beauty and the Beast. The Husband’s favourite Disney film is Aladdin – because of the Genie played by Robin Williams of course! It has nothing to do with Jasmine’s midriff baring outfit. Oh I love how sensitive little E is to beautiful music! It’s so rare to find young children who can appreciate the subtle nuances of musicals and actually be so moved by the singing. My favourite is The Little Mermaid, for having the distinction of being one of the first Disney films I ever watched. I can understand a guy enjoying Aladdin, though. It’s the most like an adventure film and has plenty of action scenes.